The impact on climate from 200 years of industrial development is an everyday fact of life, but did humankind's active involvement in climate change really begin with the industrial revolution, as commonly believed? Plows, Plagues, and Petroleum has sparked lively scientific debate since it was first published--arguing that humans have actually been changing the climate for some 8,000 years--as a result of the earlier discovery of agriculture. The "Ruddiman Hypothesis" will spark intense debate. We learn that the impact of farming on greenhouse-gas levels, thousands of years before the industrial revolution, kept our planet notably warmer than if natural climate cycles had prevailed--quite possibly forestalling a new ice age. 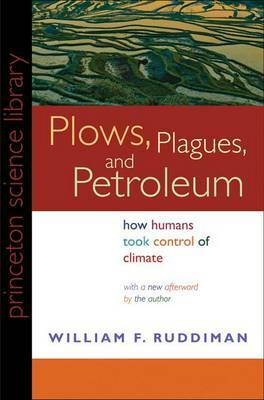 Plows, Plagues, and Petroleum is the first book to trace the full historical sweep of human interaction with Earth's climate. Ruddiman takes us through three broad stages of human history: when nature was in control; when humans began to take control, discovering agriculture and affecting climate through carbon dioxide and methane emissions; and, finally, the more recent human impact on climate change. Along the way he raises the fascinating possibility that plagues, by depleting human populations, also affected reforestation and thus climate--as suggested by dips in greenhouse gases when major pandemics have occurred. While our massive usage of fossil fuels has certainly contributed to modern climate change, Ruddiman shows that industrial growth is only part of the picture. The book concludes by looking to the future and critiquing the impact of special interest money on the global warming debate. In the afterword, Ruddiman explores the main challenges posed to his hypothesis, and shows how recent investigations and findings ultimately strengthen the book's original claims.